Our products are carried by a number of online retailers, book stores and gift shops nationwide. If you wish to place an online order please visit our E-Store powered by Amazon or follow the links on each book and calendar. If you wish to place an order over the phone, you may do so with our distributor IPG at 1-800-888-4741. 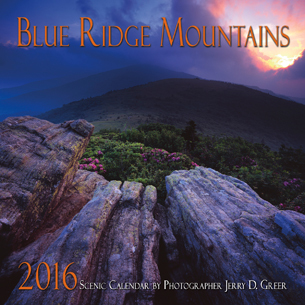 This calendar features images of the Blue Ridge Mountains from Pennsylvania to Georgia. There are plenty of images from the Blue Ridge's famous national parksâ€”Shenandoah National Park, Blue Ridge Parkway, and Great Smoky Mountains National Parkâ€”as well as many of the range's lesser known areas and scenic gems. Marked with all major holidays and moon phases, this calendar has ample room to note appointments and special events. Through the lens of a seasoned nature photographer and area local, one of the most beautiful and popular sections of the Great Smoky Mountains National Park is delightfully captured in this gorgeous wall calendar. Open fields of wildflowers, abundant wildlife, and the majestic peaks of the Smoky Mountains are aptly brought to life in this collection of unique photographs. Marked with all major holidays and moon phases, this calendar has ample room to note appointments and special events. Offering stunning vistas and endless natural beauty, this photographic exploration covers all 469 miles of the strikingly scenic Blue Ridge Parkway. 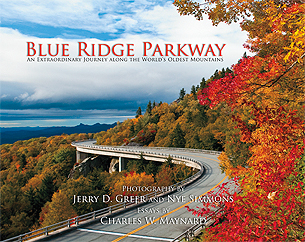 From the misty Appalachian Mountains to graceful waterfalls and fields of wildflowers, this picturesque guide also includes essays from Charles W. Maynard. This survey is a must-have for Parkway locals and nature lovers. Offering a child's perspective of the natural world through the lens of a youth photographer, this story follows Buddy the beaver around his pond. As Buddyâ€™s experiences unfold, his friends are introducedâ€”Norman the bald eagle, Peeps the peeper frog, and Cards the cardinalâ€”and each animalâ€™s relationship to the environment is explained. With vibrant photography and informative text, the pond and its inhabitants come to life. Offering a child's perspective of the natural world through the lens of a youth photographer, this story follows Buddy the beaver around his pond. As Buddyâ€™s experiences unfold, his friends are introducedâ€”Dawn the Fawn, Cheeks the Chipmunk, Larry the Land Snail, and Carrots the Rabbitâ€”and each animalâ€™s relationship to the environment is explained. With vibrant photography and informative text, the beaver pond and its inhabitants come to life. 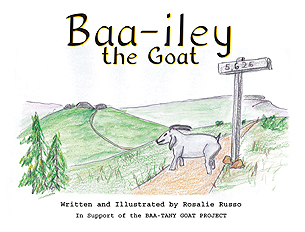 This children's book features the beautiful illustrations and wonderful story of Baa-ily the Goat by Rosalie Russo. A volunteer for the Baa-tany Goat Project, she was inspired to tell the story about Baa-ily's unfortunate experience on Roan Mountain. Â© 2012 Mountain Trail Press. All rights reserved.